Is it possible to live in a city for over 20years and practically know nothing about it? 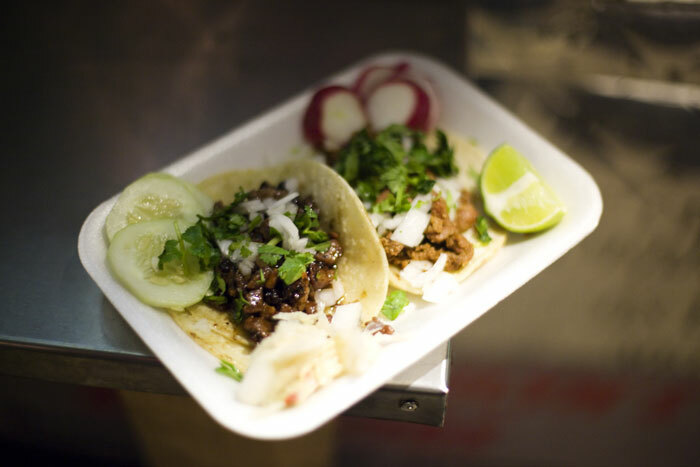 How was it possible for me to only recently found out about all these street tacos wonderness in my own backyard (even if the backyard is about an hour drive away)? I guess I know why. I didn’t REALLY get into everything food until I moved to NYC and started this blog. 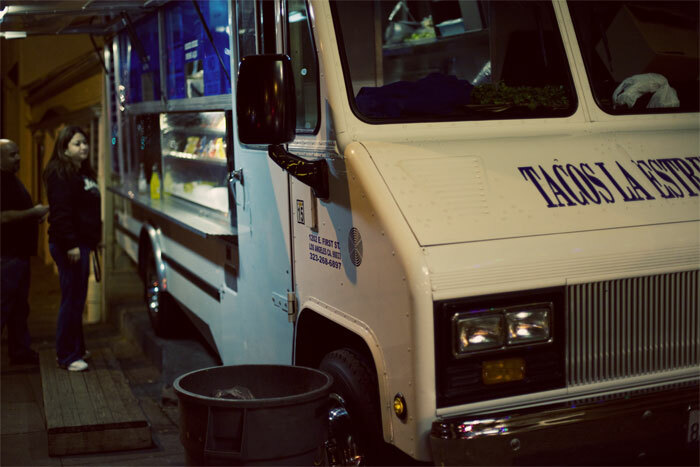 I didn’t REALLY appreciate awesome authentic tacos until I became obsessed with the trucks at Red Hook. And I didn’t REALLY get into the street food scene until this whole street food wave that took over 2009. 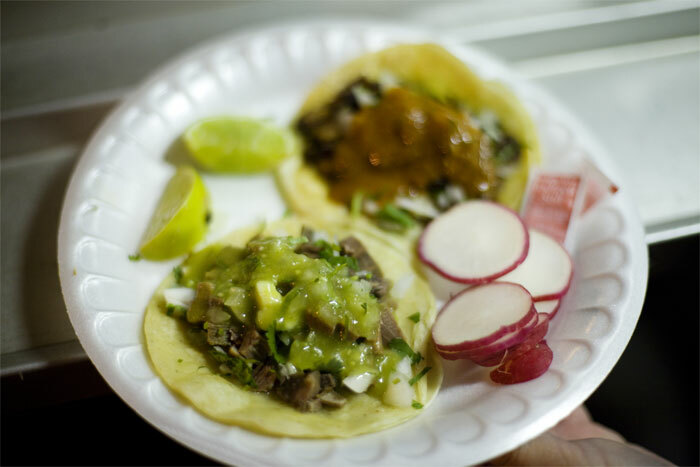 But then still I wasn’t able to grasp just how many street taco vendors are in Highland Park, Eagle Rock, Boyle Heights and etc… Not until I came upon Dylan Ho’s post about street tacos in LA. And after watching Dan Delaney taco crawling with Dylan, I wanted to go street taco crawling as well and actually pondered about asking Dylan as my tour guide. But decided not to, seem so out of the blue and he probably either ignore my email or say no. Then I thought about, hey I can just write down the locations of all the taco stands he blogged about and have my own little taco tour! And two things really set this tour into stone were Jonathan Gold, from LA Weekly, writing about Antojitos Carmen and Breed Street Scene in Boyle Heights and included their Twitter accounts. The second thing was my friend Sandy wanted to have a street taco tour as well and actually lives near to most of the vendors. I’ve done many food tours before small and big so I wasn’t expecting any different from this taco tour. It was like okay, let’s go get some tacos. I wasn’t prepare massive this whole thing was and I still don’t. I thought the 2 nights that I went pretty much covered most of the vendors but then on Yelp and a closer look at Dylan’s blog, proved that there were many many more. 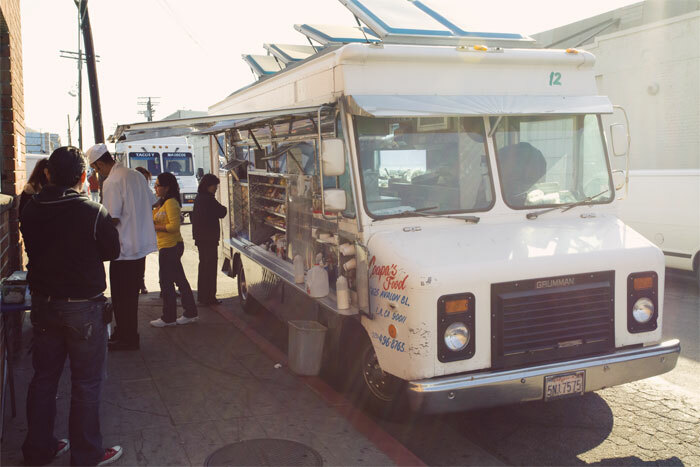 Anyways let’s start this frakkin epic journey and I do mean E P I C.
So earlier in the morning when I was visiting the Buttermilk Truck, there were 4 taco trucks all parked on the same street. I would love to have a food truck drive to my work and feed me too! 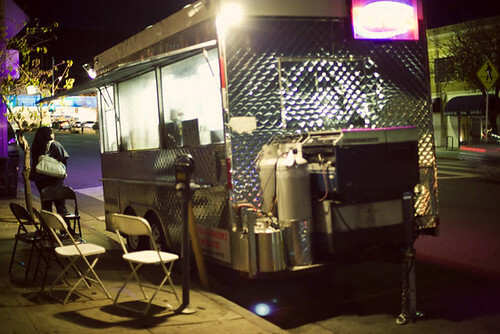 It was nice to see these taco trucks and stand, a prelude to whats to come that night. Sandy decided to start off at Carnitas Michoacan as the base. 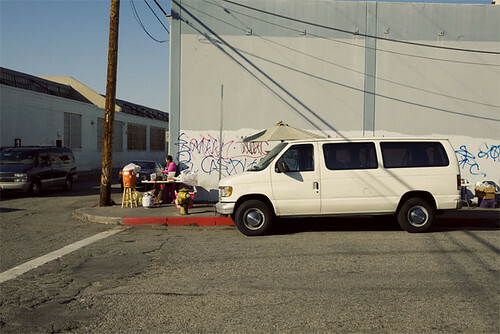 Compare a brick and mortar joint with the street vendors. We pulled into the parking and walked into the dining area through a yellow metal gate. Then out the other yellow metal gate to the street to order at the window. 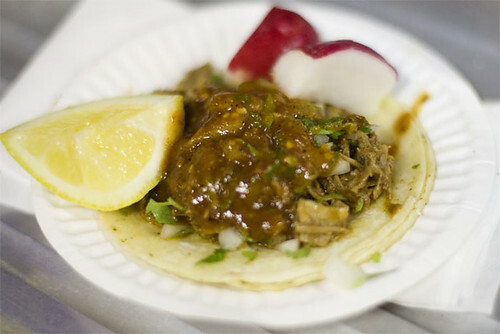 Sandy got an al pastor taco and I got a lengua taco. I see ox-tongue I get ox-tongue. When we were about to pay I was surprised to find out how cheap it was! $1.25 for 1 taco. I was so used to paying NYC prices that it shocked me that it was so cheap. 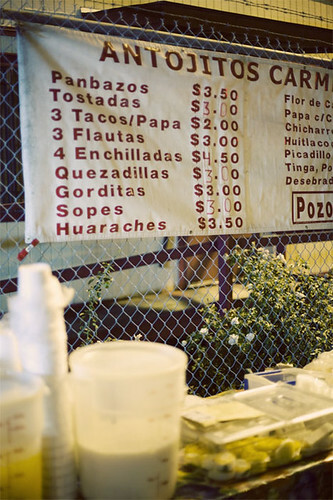 Just so you know $1.25 is considered expensive for tacos in LA. We walked inside to the dining area to wait for our tacos. After getting our tacos we sat down at one of the tables. When I took out the tacos, which were wrapped in tin foil, I thought they only gave us 1 taco because it was kind of small. Remember I was used to NYC prices and sizes. Nope they wrapped the 2 tacos together and I realized that the tortillas used by the LA taco vendors were slightly smaller than the NYC ones. But how did it taste? 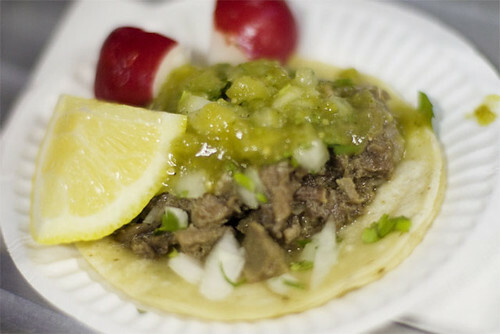 Well like most lengua taco, it was okay. 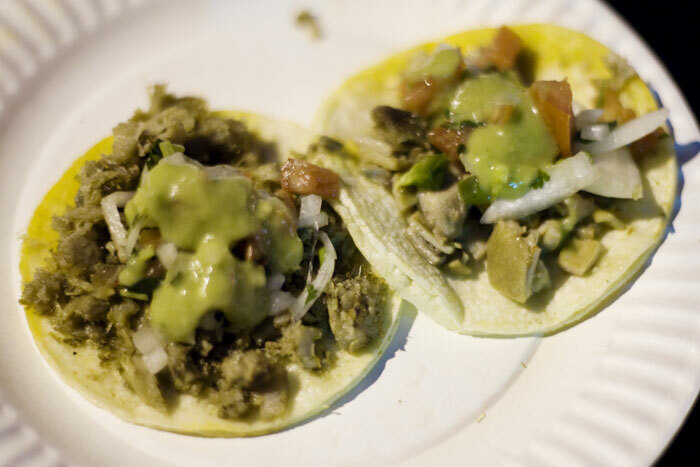 The problem with lengua or ox-tongue is that it is usually served in tiny pieces. Can’t really taste the flavors of the tongue. I would love to come back here and have a proper meal. So the night before my first street taco run, I went to the world wide web for information about Antojitos Carmen. I wanted to double check their schedule but of course I got a lot of different answers. Some said Fridays to Sundays, some said Fridays to Tuesdays and some said Tuesdays to Fridays. In the end I tweeted to Antojitos Carmen to see if they were opening the next night. To my surprise they wrote back saying YES they will be open. Sweet! 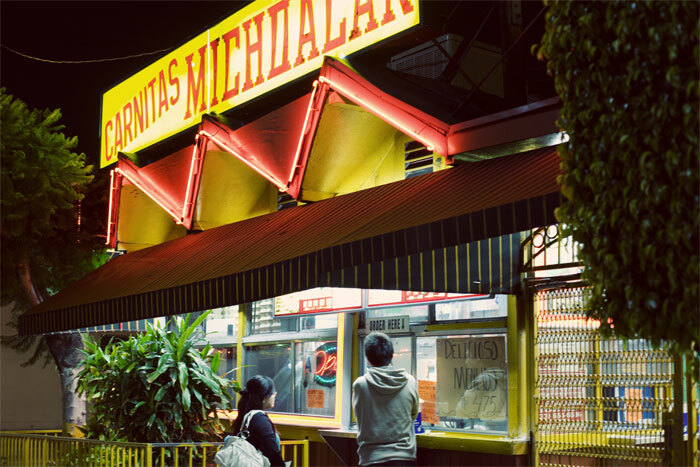 So after going to Carnitas Michoacan, we hopped back into the car and drove to Boyle Heights, Cesar E Chavez and Matthews to be exact. After finding a nearby parking spot we walked up to the street vendors. 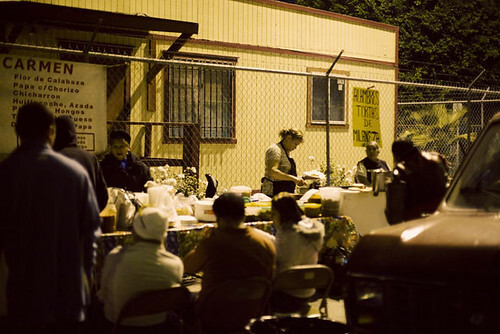 There were 4 vendors that night all lineup next to each other against the metal fence. And along the sidewalk were chairs for diners to use but most of the people that were there that night stood while eating. I believe we were the only non-Spanish speaking people which of course means 100% authentic. Antojitos Carmen was right next to the goat meat vendor and took up the most space with 3 tables. 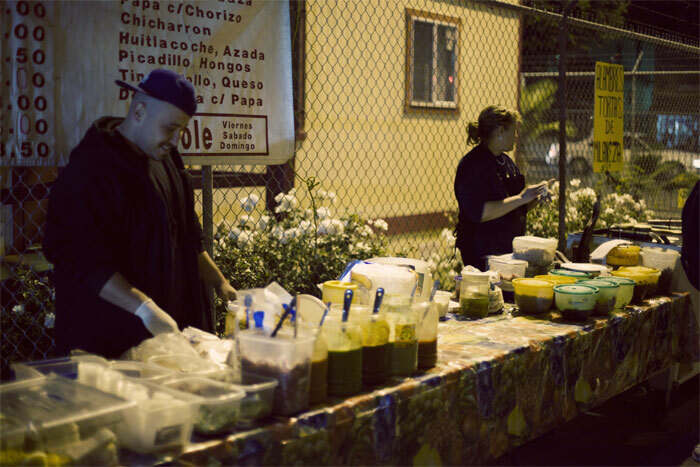 There were 2 other vendors next to Antojitos Carmen but eh I don’t remember what they served. There first table at Antojitos Carmen was where they cooked the stuff and next to it were 2 tables filled with buckets and tubberwares filled with sauces, onion, cilantro, lettuce…everything that you can think of to put on top of your wonderful tacos. 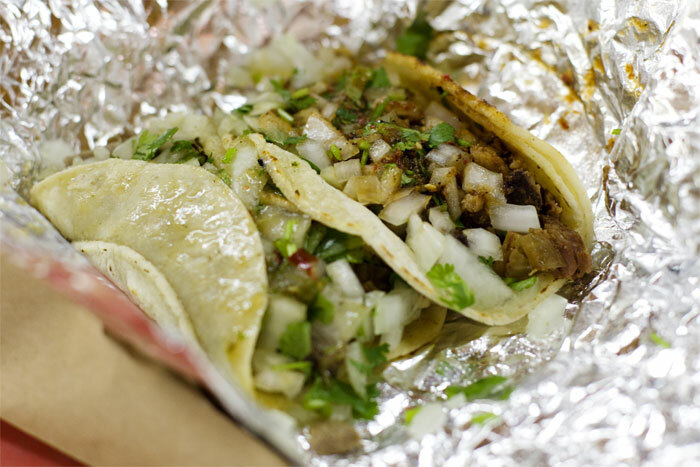 By the way, its 3 tacos for $2 here or 1 for $1. I guess we looked lost because Abe started to talk to us. We chatted a bit talking about how we found them and how they have been doing this for about 20 years over at Breed Street. They moved to Matthews St because of the cops. I have read about the awesomeness of Breed St but no more. 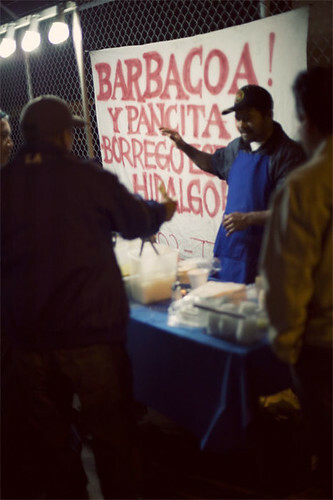 Restaurants around the area got pissed off and called the cops and the vendors scattered all over Boyle Heights but seriously after so long they call the cops now? Weird. I asked Abe if he was in charge of tweeting, he said yes and I told him I was the one that tweeted them last night. Sorry for the long paragraph, lets eat some tacos! Since everything was written in Spanish I had to ask Abe to tell me what papa c/ chorizo was, I knew what pollo and chicharon were. Sandy, a fan of chicken and pork skin, went with the chicharon taco and I got a potato with chorizo taco. If you don’t speak Spanish well do what we did and order your tacos through Abe and he’ll relay the message to his mom, she’s the cook. Within minutes we got our tacos. One thing that is different between taco trucks and taco tables is that at the taco tables anything and everything you want to put on top of a taco is right there on the tables. So you can pick what you like and mix and match all you like. Abe handed us our tacos and we slowly moved from 1 bucket of condiments to the next. A little onion, some clintro of course, some green sauce, a little of this and that. A quick photo before consuming. As usual I ate my taco way too fast so I can’t describe the different textures or flavors. Well I’m not good at describing anyways but just believe me it was damn good, damn damn good. 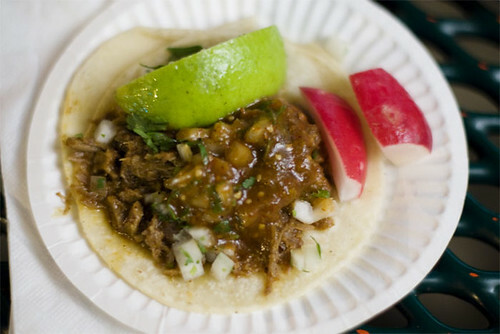 Sandy was in love with her chicharon taco as well. 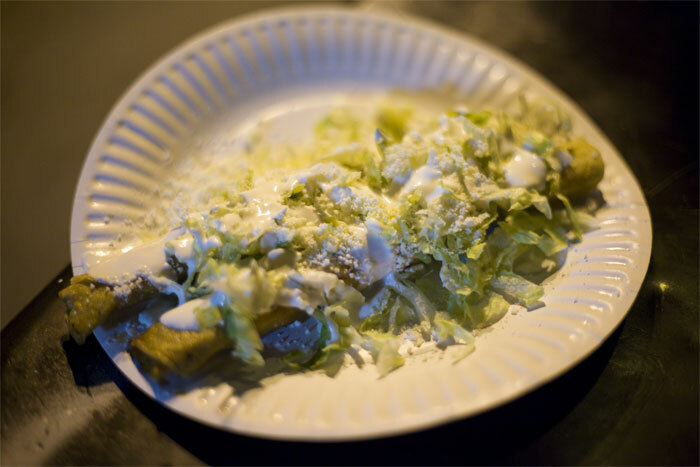 Abe was super duper nice enough to give me a plate of taquitos stuffed with beef and topped with lettuce and mayo. He even took our photo! Our next stop brought us to Highland Park. 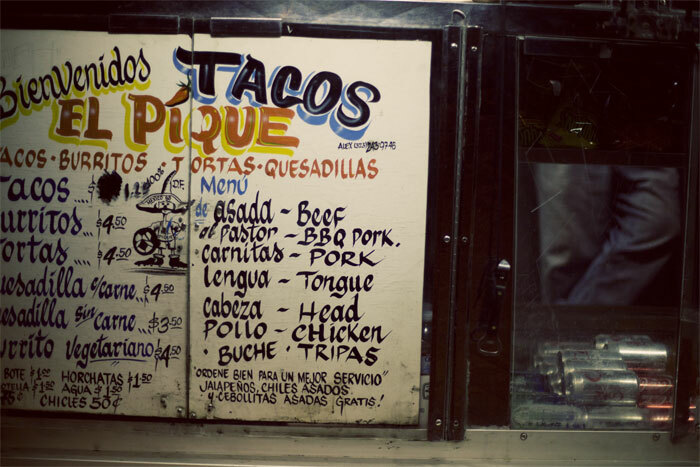 El Pique Taco Truck was parked in a self-serve car wash lot on York Ave. We pulled into the empty lot and found a lonely taco truck. 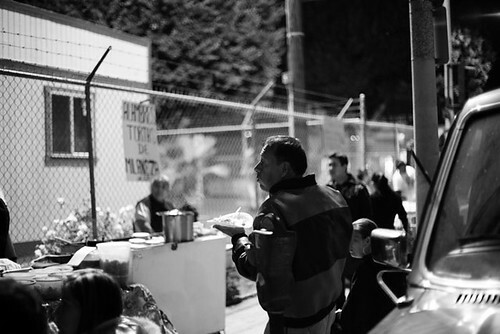 Sandy told me La Estrella Taco Truck which was stationed just on the other end of the same block as El Pique Taco Truck got loads of people while El Pique was always empty. 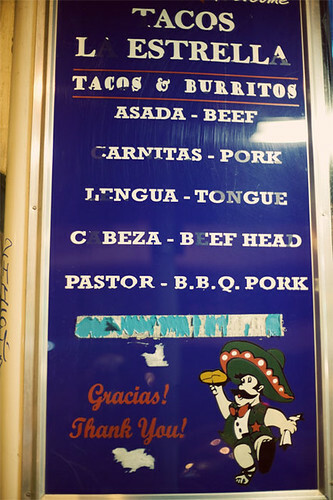 So again Sandy ordered the al pastor while I ordered the lengua. 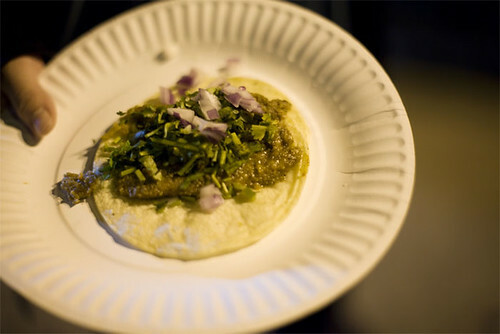 I took a bite of the lengua taco and I quickly realized why El Pique was always empty, the taco was just meh. After we were done we walked over to La Estrella. 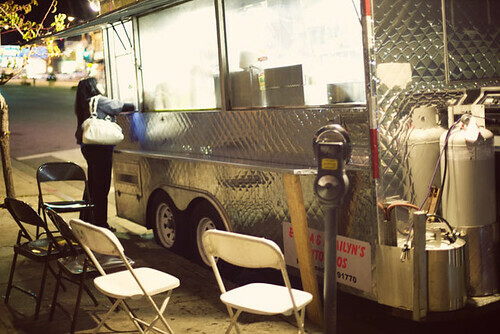 La Estrella was sorta different than the other taco trucks. It was a truck but it parked in a spot, if that makes sense. Not the street nor a parking lot but an actual spot. That made the truck stationary. It even had its own sign! 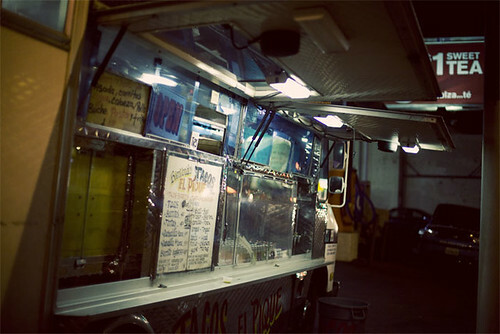 This truck is Sandy’s favorite and of course she got an al pastor taco. I thought about getting the same thing too until I saw cabeza or beef head. I suspected it to be beef cheeks. 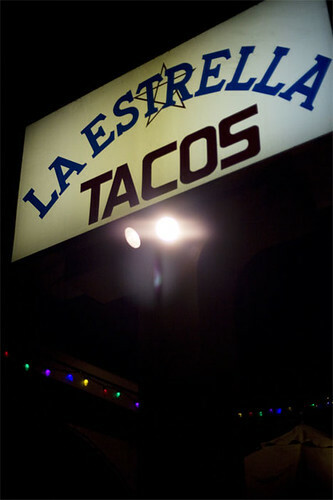 La Estrella was on the higher end with $1.25 per taco. After we got our tacos we sat down at the table next to the truck. It looked really good and it tasted really good too. I could tell this was way above El Pique because the taco was hot and had loads of flavors with a slight kick to it while the taco from El Pique was room temperature-ish. For our final stop on our first night of taco crawling, Sand took me to her local spot. Local meaning by her house. You find it by looking for the big U-Haul sign and the unnamed taco stand will be directly across it. Here you’ll find a giant vat of meat parts being cooked and stewed, a hot table and a giant thing of rotating meat being cooked by opened flames (like shawarma). Since I knew it was our last stop I ordered 2 taocs buche or cow tummie and beef shoulder. I later found out that you can ask them to cook the buche again to make it crispier. Again being that this was a taco table, the condiments and stuff were self-served. The tacos here were pretty good. Not as good as La Estrella but pretty damn tasty. I think they did dice the meat up too fine though. And that was the end of our first night. On Friday, New Year’s Day we headed back out for our second night. 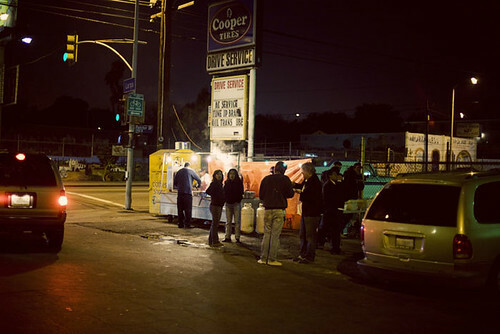 Since Boyle Heights was out of the way compare to other taco places we went to visit Abe first. This time I was hoping to get a goat meat taco but no luck the dude wasn’t there. We chatted a bit with Abe again before getting our tacos. Sandy went with the chicharon again. I was curious about the chicahron so I got that and also tinga a spiced up beef. 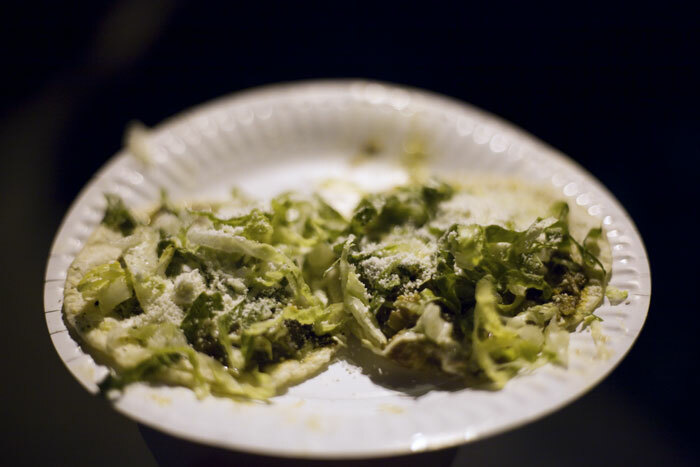 When Sandy got her chicharon taco she was puzzled. It didn’t look like a chicharon taco but Abe assured her that that was chicharon. She took a bite of the taco and was glad to find out it was chicharon. Abe explained that they chopped up the chicharon and probably mixed it in with some pieces of beef. I took a bite of my chicharon and was super surprised to find out how good it was. I couldn’t really see any chicharon but I felt the crunchiness and the taste of chicharon. It was like magic! This sure beat the chicharon taco I got at Red Hook once where they gave me giant pieces of chicharons. Got tired of breaking them with my teeth. 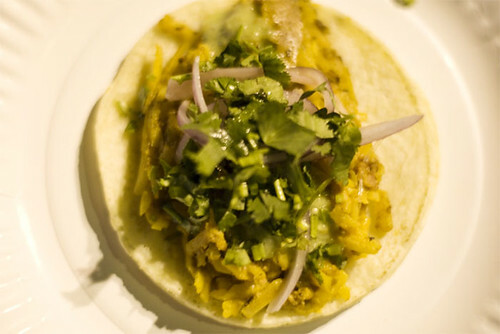 The tinga taco was awesome too! A little smoky with a nice kick to it at the end. Awesome stuff. If you like Red Hook and you’re in LA please go visit Antojitos Carmen. We stumbled onto this trailer while on our way to La Estrella on York Ave. I couldn’t find any info on them on the internet. It was ran by 2 ladies. I guess they were trying to ride the fusion taco wave because they had Korean bbq tacos. They were out of chicken that night so I opted for the Korean bbq beef. What’s great about this trailer is that they only cook it when you order it. Through the big window I was able to see the lady cooking the beef. After a bit of a wait we finally got our tacos. Yes Sandy got al pastor again. I picked up my taco, OUCH it was so hot! It nearly burnt my fingers. I quickly took a bite. Well they cooked the beef really well. Really strong flavors. Maybe a bit toooo strong because it was kind of salty. I could taste a bit of sweetness too. If they can lower the saltiness this would’ve been a great taco. Our last stop on our second taco crawl, we decided to go back to La Estrella. Why? 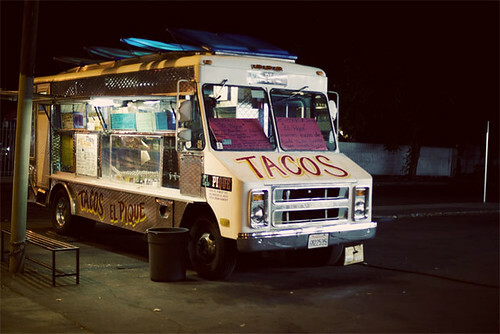 Why go back when there were tons of other taco trucks and stands? Well we early. Most of the trucks say they’re out at 5:30pm but in reality more like 8pm. We started our tour around 6:30pm so by 8pm we were full and tired. Knowing that La Estrella on York Ave doesn’t actually move we were sure it would be there. This time I decided to stick to my usual and got lengua. It was really good! Wonder if I can, next time, ask them to make the tongue crispier? After I finished my taco I was debating if I should get a second one. 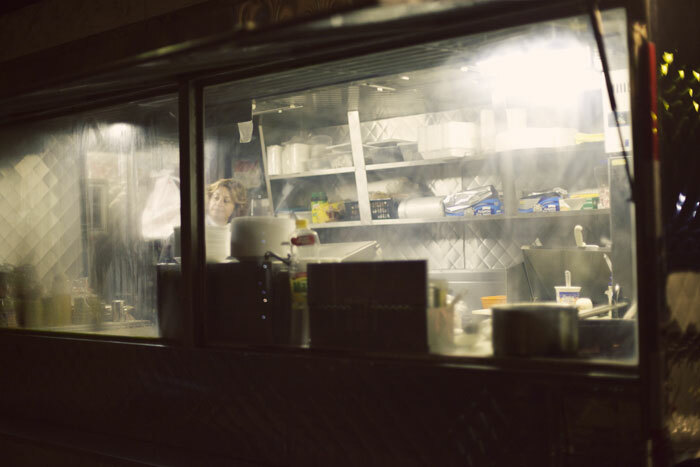 After all the al pastor tacos that Sandy had she still preferred the one from La Estrella. I had to try it and so I did. OMG it was so full of yummie flavors. 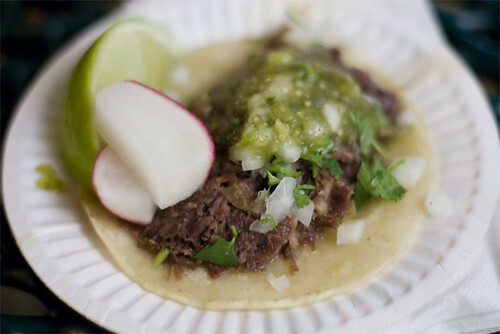 It was way better than my lengua taco. I’ve been living in NYC since 2003. I know one day I’ll move back to LA but NYC is just too damn fun to leave. If my family is reading this, I’m sorry but while I was taco crawling I thought wow I wouldn’t mind moving back to LA for these fine fine tacos. 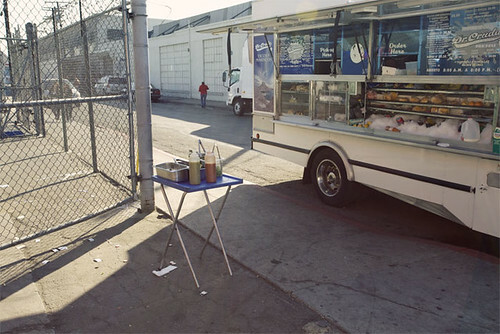 Come on who doesn’t like to eat street tacos in the middle of Winter because LA Winter is nothing compared to NYC. 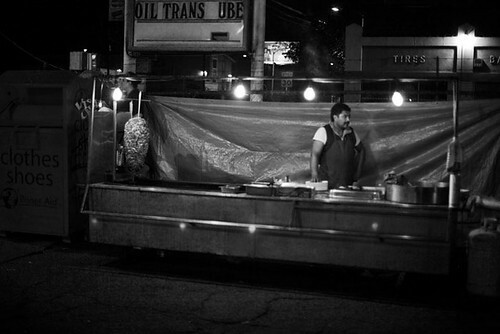 I need more street food, it’s addictive.